Except for the Brownie cake I made for my birthday recently, I never made Brownies myself (as I never made chocolate bars, creamy cakes, tartes etc. 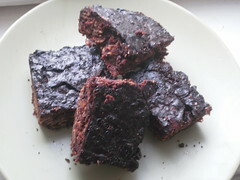 before I joined TWD, so it is not really something extraordinaire that homemade Brownies are new to me). Because I take everything I bake to work (no husband, no kids, no dog), I always appreciate recipes that can be transported easily, as the one Tanya of Chocolatechic picked for this week. This month, I am especially lucky in this regard! You may find the recipe at her page or in the book. One of my colleagues is gluten- and lactose-intolerant and I don't do the extra work often, but sometimes I try to bake things she can also enjoy (with less success, I have to admit). This week was one of these weeks. 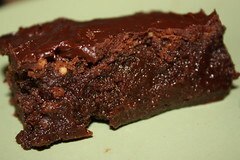 I chose to make a second Brownie recipe, and opted for the "Tribute to Katherine Hepburn" Brownies. I just love Katherine Hepburn. I do. But let's first speak about the duty, before the pleasure. Rick Katz Brownies for Julia turned out to be a bit of work, at least compared to what I expect of Brownies (what is a batter mixed together in 5 min. without any difficulties). It was not that tricky, but nevertheless you need at least three different pans/bowls, and some more time as you have to whip part of the egg-sugar-mix. For the chocolate I again mixed different sorts. The recipe calls for 4 ounces (112 g) unsweetened chocolate. Originally, I intended to half the recipe, so I had only about 2,5 ounces (70g) at hand. In sum, I needed 6 ounces (168g) of chocolate so I decided to just take more of the other chocolate. 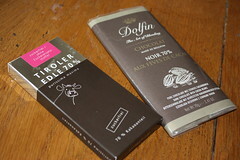 I had 2,5 (70g) of excellent Dolfin chocolate (70% with little cocoa bean pieces - great!) and replenished for the rest with ordinary 70% chocolate. For the rest I did as the recipe said. As always, I used spelt flour and cane sugar. It worked out quite good for me. I sprinkled a small band with shredded almonds, and another one with non-pareilles, just to test it. The part with the pearls did not turn out to be a great idea. Nothing bad happened, but they lost their colour and it is just not necessary. But the almonds look pretty fine. Like with many others, the inner parts stayed very, very humid (or "gooey" - a new word I learned. Generally, TWD is a language crash course for me. Gooey, fudgy, cake-like is what I learned this week :o]). As I said in the beginning, I am a big fan of humid Brownies. But it was not really possible to cut them, and I guess that's too much humidity. I decided to frost them and had the great idea to make a white-chocolate-iceing also for the Hepburn-Brownies, so I had to use the lactose free butter and the no-lactose-no-gluten chocolate. Not such a good idea. I don't know what went wrong, but I made it again afterwards with ordinary butter and chocolate, and the second time it worked out, so I guess for this one time it was not my fault. Maybe lactose is necessary for the iceing. Anyways. My lactose-and-gluten-free attempt turned out as an ugly butter-soup with ropy chocolate algae. Really ugly. I spare you with the pics. 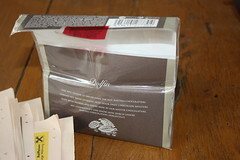 But the second iceing, with ordinary dark chocolate, was fine, and I used it for a part of the Katz-Brownies. Now I have a band sprinkled with shredded almonds, a strip glazed with dark chococlate iceing (some pieces having non-pareilles under the iceing what gives them a crunchy cover that I enjoy! ), and some pieces pure and simple. Finally, I put the Rick Katz Brownies in the fridge (because I read that could improve the almost-liquid-problem. And it did). Brownies can't be wrong for me, so I definitely appreciated them. Thanks to Tanya for choosing them! The batter was easy. I just added a bit less coffee powder, no cinnamon and almonds for the nuts. The test piece (see left) turned out as a brick. Really. A round, black, brittle-not-in-a-good-way brick. The "real" piece looked the same, but I found out that the inner parts are ok. I just had to cut off the edges (well, if you call 2 cm still an "edge"). They are more cake-like than anything else. I finally did pass them over to my colleague, but they are really not my best piece of work. Mmm, double the pleasure. I thought the Tribute brownies were the best ones yet. Yum they look good. I followed the wrong directions! Very "humid" indeed - but tasty too!